Thoughts, Experiences and Reality: My last summer getaway? This summer was so much fun for me. I had been into beautiful places such as Bacolod, Zambales, Taytay and now... Pangasinan. 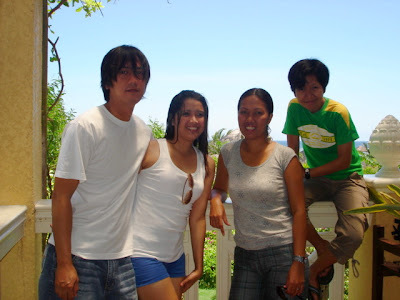 I was invited to join my former office's summer outing in Puerto del Sol, Bolinao, Pangasinan. I gladly joined because I know that it would be so much fun and I want to be with my friends again. We were supposed to be leaving Marikina as early as 4:30am but we overslept. 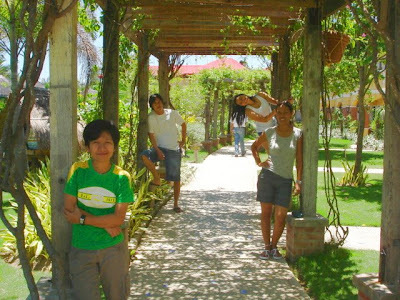 So, the others left us and agreed to meet us in Luisita, Tarlac. We left Marikina at around 6:00 am and we were able to get to the meeting place as soon as we can. We arrived in Bolinao at 11:30 am, it was quite a long drive. It was only then that I found out that Bolinao is the last town in Pangasinan. We were screaming with glee when we reach the resort. Finally, after long hours of driving we can see the beautiful landscape of Puerto del Sol, the beautiful cottages, the white sand, the calm and peaceful sea, the swimming pool and the jacuzi. We were welcomed with drinks and a necklace made of small sea shells. We had an outdoor lunch after a few minutes and since we're supposed to check in at 2PM, the rooms were not yet ready by the time we finished our lunch. But it was okay because we were allowed to stay in the huts were we can lie down and get some fresh air. The huts are beautiful, with curtains all around. We also took our time taking pictures all around the resort. It was a sunny day but we don't really mind for as long as we get to have our pictures taken. After a little more than an hour of waiting, we got into our room. It was airconditioned, with two beds, a balcony and a bathroom. It was really cute, I really like going out on the balcony where you can see the pool, the sea and the beautiful landscape. We rested for a few hours, watched cable TV, take a few winks and then we went down at around 6PM and played billiards. I really don't know how to but I enjoyed it. Dinner was served after an hour. After dinner, we went directly to the pool (we've already worn our swimsuits when we left the room). The water was unexpectedly warm and I enjoyed it very much. We even tried the jacuzi, but we didn't enjoy it that much. But we enjoyed taking pictures while we're on it. We went back to our rooms when we got tired of playing around in the pool. We were supposed to drink but I guess we didn't know that we were still tired from the trip. I actually dozed off first and when I woke up at 5AM, it was sunrise. We went down to try the sea this time. The water was shallow and just knee deep so we just walked but we dare not reach the breakwater since they said that beyond the breakwater the water would be 40ft. deep. I don't want to find out and I think nobody did. We posed for some pictures again (I think that's what we did most of the time) and then had breakfast and got dressed to leave. We bought a few things in the souvenir shop before we finally left the beautiful Puerto del Sol (Port of the Sun). It was a wonderful, fun-filled summer getaway. Will this be my last for this year? I don't really know.